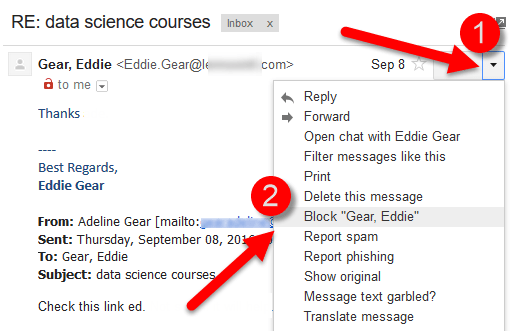 Today we will show you a valuable trick name How To Block Email Address In Gmail On Web. Emails are something we all go through in our daily lives and when it comes to email services, Gmail is undoubtedly the most popular service out there. Google is rolling out an update for Gmail that allows you to quickly and painlessly block specific email addresses in just a few taps. Block email address in Gmail on Web or Android with the help of some simple settings in your Gmail account to block any email or particular text emails on your account. The block feature is being switched on from today on the Web and will roll out to Android devices in the next week. Blocking an email address in Gmail’s web client is fairly easy. The method is very simple and depends on simple email settings that will help you to block email address from all the networks that irritate you in your emails. Simply follow the instructions. First of all, you need to login into your Gmail account where you want to block email address. Now you need to go to an email from the sender you want to block. After that you need to hit the button beside the Reply button. Here you can find the block option. From the options click on the Block <Sender’s Name> option. After that it will ask you to confirm that you really want to block the person. That’s why you need to click Block again to confirm that you indeed want to block the email address on Gmail. As we already told you that Emails from blocked email address will go into the spam folder from now on, so you can be at peace. It was the easy ways through which you can block emails from someone in Gmail. If you want to block any address then you can use this easy way to block. Stay with us to get more new trick.